The Intra-Disciplinary Seminar (IDS) Public Lecture Series presents a lecture by An-My Lê entitled "Scale and Conflict". It is free and open to the public. What is autobiographical? What is political? These are questions this talk will engage through a discussion of An-My Lê's photographic projects “Small Wars” and “Events Ashore” presented in the form of a long essay. An-My Lê was born in Saigon, Vietnam, in 1960. Lê fled Vietnam with her family as a teenager in 1975, the final year of the war, eventually settling in the United States as a political refugee. Lê received BAS and MS degrees in biology from Stanford University (1981, 1985) and an MFA from Yale University (1993). 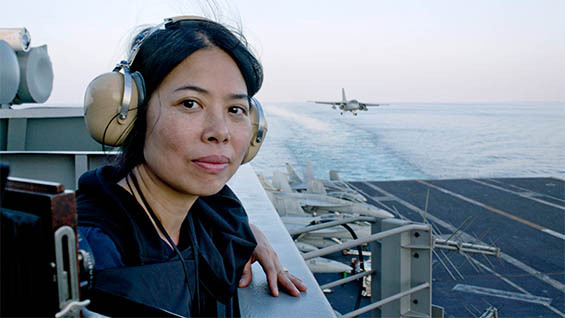 Her photographs and films examine the impact, consequences, and representation of war. Whether in color or black-and-white, her pictures frame a tension between the natural landscape and its violent transformation into battlefields. Projects include Viêt Nam (1994–98), in which Lê’s memories of a war-torn countryside are reconciled with the contemporary landscape; Small Wars (1999–2002), in which Lê photographed and participated in Vietnam War reenactments in South Carolina; and 29 Palms (2003–04), in which United States Marines preparing for deployment play-act scenarios in a virtual Middle East in the California desert. Suspended between the formal traditions of documentary and staged photography, Lê’s work explores the disjunction between wars as historical events and the ubiquitous representation of war in contemporary entertainment, politics, and collective consciousness. She has received many awards, including fellowships from the John Simon Guggenheim Memorial Foundation (1997) and the New York Foundation for the Arts (1996). She has had major exhibitions at San Francisco Museum of Modern Art (2006); Henry Art Gallery, Seattle (2006); International Center of Photography Triennial (2006); P.S.1 Contemporary Art Center, Long Island City (2002); and the Museum of Modern Art, New York (1997). Lê lives and works in New York.